FILE - Pervin Buldan of the People's Democratic Party addresses reporters before starting a hunger strike in support of jailed Kurdish lawmaker Leyla Guven's own hunger strike against the isolation of Kurdish rebel leader Abdullah Ocalan in prison, in Ankara, Dec. 4, 2018. Turkish police have detained dozens of people, mostly women, in multiple raids on the local headquarters of the pro-Kurdish People's Democratic Party (HDP) since Monday, targeting party members and supporters who were on a hunger strike in support of the imprisoned HDP lawmaker Leyla Guven. Guven was arrested January on terror charges following her statements on social media against Turkey's Operation Olive Branch in Syria's northwestern region of Afrin. During her judicial hearing last month, she said she was on an indefinite hunger strike in protest of the prison conditions of the outlawed Kurdistan Workers' Party (PKK) militant leader Abdullah Ocalan. HDP officials told VOA the police raids this week targeted party members and activists who went on hunger strikes in solidarity with Guven. They said police broke into their local headquarters to end the strikes and arrested 29 members in Batman, 25 in Diyarbakir and 14 in Van. "This unlawful action toward the women who want to be the voice of a peaceful demand once again demonstrates the truth which is empowering Leyla Guven's hunger strike on its 34th day," read a HDP statement following the arrests. FILE - People hold posters of jailed PKK leader Abdullah Ocalan and PKK flags as they gather outside the headquarters of pro-Kurdish Democratic Regions Party, DBP, on the 17th anniversary of Ocalan’s expulsion from Syria, in Diyarbakir, Turkey, Oct. 9, 2015. The statement asked Turkish officials to end the isolation of Ocalan, who serves a life sentence and remains the sole inmate of the island prison of Imrali in Bursa province. "The biggest obstacle to democratization and resolution is the isolation itself," HDP said. Turkish officials were not available to comment on the arrests, but the semiofficial Anadolu Agency said the raids were carried out by counterterrorism units against suspects "who are propagandizing for a terrorist organization." A VOA reporter present near the HDP headquarters in Diyarbakir said dozens of police equipped with riot shields could be seen around the building as anti-terror police led HDP members into police vehicles. Xaje Kiye, the head of HDP in Van province, warned that the strikes would continue and might expand if Turkish authorities did not address their concerns about Ocalan's living conditions. "Our activities will continue regardless of the attacks," Kiye told VOA. "We will firmly stand with our colleagues." 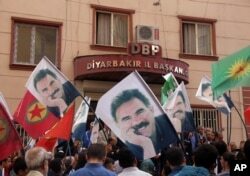 Complaint about the prison conditions of Ocalan and uncertainty about his health is not uncommon. Kurdish protesters for years have held demonstrations demanding an end to his isolation. The PKK leader has been in prison since 1999 and has been prevented from visiting his lawyers and family members since late 2016 after a peace process to end the Kurdish insurgency failed. The Turkish government considers PKK a terrorist organization and charges that government operations in the predominately Kurdish southeast region only target those suspected of ties with the separatist group.